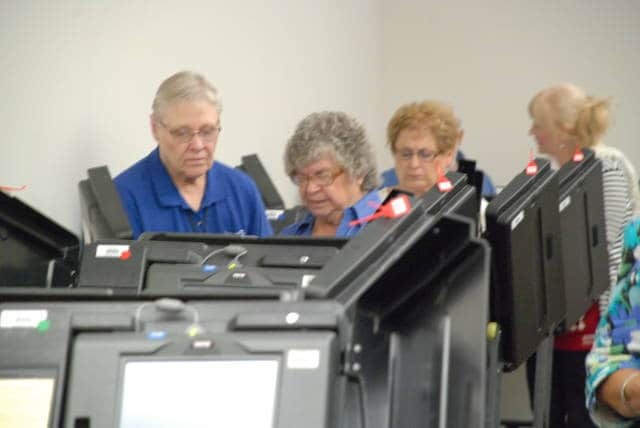 On Nov. 7, Delaware County residents will be asked to vote on local candidates and issues. Oct. 10 is the deadline to register to vote. For information about local elections, visit delawareboe.org. Voters will enter the polls Nov. 7 to decide on candidates for municipal offices in Delaware County. A field of six candidates is seeking to fill three at-large seats on Delaware City Council. The incumbents are Mayor Carolyn Kay Riggle, Vice Mayor Kent Shafer, and George Hellinger. Challengers vying for a seat on the council are Dustin Reed Nanna and two write-in candidates, Christopher Bryan Cook and Laura Helena Roberts. Three candidates are running for 3rd ward council member in Delaware. Councilman Jim Browning’s term ends in November and he is seeking reelection to the seat. Hoping to unseat him are Ben Kelly, George Mantzoros, and George McNab. In Powell, there are eight candidates running for the four available seats on city council. Incumbents running for reelection are Mayor Brian Lorenz, Frank Bertone, and Thomas Counts. Challenging the incumbents are Christina Drummond, David Ebersole, Jeffrey Gardiner, Melissa Riggins, and Sharon Valvona. Village residents across Delaware County are being asked to decide on council members and members of the boards of trustees of public affairs. In Ashley, four village council seats are on the ballot, but only three candidates filed to run in this election. Incumbents Cheryl Friend, Wayne Lockhart, and Jym Longstreth are seeking reelection. Board of trustees of public affairs president Monte Smith is asking voters to reelect him to another term to the board. He is the only candidate seeking the office. In Galena, four village council seats are on the ballot. Incumbents David Simmons and David Walker are seeking re-election to another term. Kathy Krupa and Bob Molter are seeking to fill one of the two seats being vacated by David Adams and Joseph Stoll. Neither Adams or Stoll filed to run for reelection. In Ostrander, four village council seats are on the ballot, but only three candidates have filed to run. Incumbents Gwen Stayner Mansfield, Joseph Proemmand, and Tracy Stojkov are seeking reelection. Renee Creedon’s term ends at the end of the year, but she did not file to run for reelection. In the race for member of the board of trustees of public affairs in Ostrander, there weren’t any filings for the open seat. In Shawnee Hills, six candidates are running for four seats on village council. Incumbents Jim Gauldin and Michael McVan are seeking another term. Mary Gates, Renee Matney, Jeff Stacy, and Robert Thatcher are also seeking seats on council. Incumbents Mahesh Dalvi and Josh Vidor did not file with the board of elections to run for reelection. In Sunbury, four candidates are on the ballot for the four available village council seats. Scott Weatherby is the only incumbent seeking reelection. Martin Fisher, Dave Martin, and Joe St. John are the other three council candidates who have filed for the election. For information about elections in Delaware County, visit delawareboe.org. The deadline to register to vote in the November election is Oct. 10. This entry was tagged Delaware City, delaware county, Village of Ashley, Village of Sunbury. Bookmark the permalink.